It's important to compare mattress sizes before you buy a bed, and understanding bed and mattress sizes are both critical when it's time to make a quilt or buy sheets and other types of bedding. Full-Size Mattress, (also called a Double Mattress): 54" x 75"
See a larger version of my mattress sizes chart for a visual comparison. There are no standard mattress depths. Some mattresses are 9-10 inches deep, but many pillow top mattresses measure 15-16 inches in depth, or even more. Box springs and other components lift a mattress even higher off of the ground. 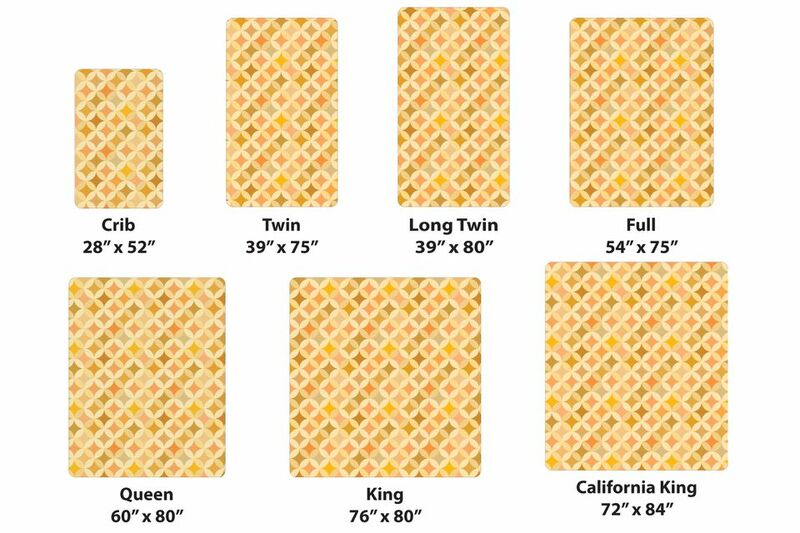 Consider the added height before you design a quilt or purchase other types of bedding. If you're making a quilt for your own use, it's much easier to consider all of the bed size what-ifs. But if the quilt is a gift, you may not be certain which type of bed it will cover. When that happens, consider designing a quilt that fits a queen size mattress, the most popular bed size. Many quilters make quilts for national and local fund-raising groups. Others sew quilts that will be donated to projects such as Quilts of Valor, a group that gives quilts to U.S. soldiers. There are hundreds of other groups that distribute quilts to children and adults. Be sure to follow each group's instructions carefully when you make a comfort quilt. You may need to keep the quilt within a specific size range, and in some cases, the group may tell you which fabrics and other materials are suitable. How much extra quilt width should extend past each side of the mattress to create a nice drop? Will the quilt look better if the primary focus of its design stops at mattress edges? Will the quilt be used with a dust ruffle? How much extra width and length is required to make sure the quilt extends past the top edge of the ruffle? Does the bed have a footboard that will interfere with the quilt? Would the quilt look better tucked under the mattress? How will the quilt look with pillows plumped underneath? Would it be better to alter the top border width and make coordinating throw pillows to place on top of the quilt, near the bed's headboard? You could also choose to eliminate the top border. For pillows placed on top of the quilt, consider making throw pillow covers to match or coordinate with the design.